He is al-Habib al-`Allamah al-Musnid Salim bin Hafiz bin `Abdullah bin Abu Bakr bin `Aydarus bin `Umar bin `Aydarus bin `Umar bin Abu Bakr bin `Aydarus bin al-Husayn bin al-Shaykh al-Fakhr Abu Bakr bin Salim bin `Abdullah bin `Abd al-Rahman bin `Abdullah bin Shaykh `Abd al-Rahman al-Saqqaf bin Shaykh Muhammad Mawla al-Dawilah, bin `Ali Mawla al-Darak, bin `Alawi al-Ghayur, bin al-Faqih al-Muqaddam Muhammad, bin `Ali, bin Muhammad Sahib Mirbat, bin `Ali Khali` Qasam, bin `Alawi, bin Muhammad Sahib al-Sawma`ah, bin `Alawi, bin `Ubaydullah, bin al-Imam al-Muhajir il-Allah Ahmad, bin `Isa, bin Muhammad al-Naqib, bin `Ali al-`Uraydi, bin Ja`far al-Sadiq, bin Muhammad al-Baqir, bin `Ali Zayn al-`Abidin, bin Husayn al-Sibt, bin `Ali bin Abi Talib and Fatimah al-Zahra’, the daughter of our Master Muhammad, the Seal of the Prophets ﷺ.
Habib Salim was born in in the town of Bondowoso in East Java, Indonesia, in 1288 (1871) and in 1297 his father, Habib Hafiz, travelled with him to Hadramawt. They settled in his father’s birthplace, the village of Mishtah near Tarim. It was there that Habib Salim began his study of the Qur’an. In 1304 his father took him to seek knowledge in Tarim. He came under the supervision of the Mufti of Hadramawt, Habib `Abd al-Rahman bin Muhammad al-Mashhur. He and a group of students would spend the night in Habib `Abd al-Rahman’s house. The students would then accompany Habib `Abd al-Rahman to the Masjid of Shaykh `Ali in the last third of the night where they would recite the Qur’an until Fajr. Thereafter they would read books to Habib `Abd al-Rahman until Ishraq and then return to his house. The rest of the day would be spent attending gatherings of knowledge and remembrance. After a year in Tarim, Habib Salim moved to Say’un to be with his father. He studied at the hands of the great scholars of Say’un of the time, among them Habib `Ali al-Habashi and Habib `Ubaydullah bin Muhsin al-Saqqaf. Thereafter he returned to settle in Mishtah, but made regular visits to scholars throughout the Hadramawt region. He made a number of expeditions to the Hijaz and visited Java, India and East Africa. He took knowledge from the scholars in each place he visited and connected to their chains of transmission. 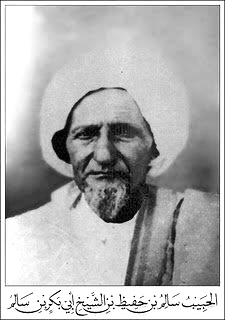 The importance of the isnad or chain of transmission is reflected in the statement of Imam `Abdullah bin Mubarak: “The isnad is part of the religion and had it not been for the isnad anyone could have said whatever they wished to say.” Habib Salim’s concern for preserving these chains of transmission is reflected in his work, Minhat al-Ilah. In it he mentions no less than 149 of his shaykhs in Hadramawt and elsewhere. He includes a brief biography of each shaykh and mentions the nature of his connection to him and any written ijazah he received from him. We are indebted to Habib Salim for this work, and he is rightly known as a musnid for his preservation and transmission of these chains. He mentions at the forefront of his many teachers: Habib `Aydarus bin `Umar al-Habashi, Habib `Abd al-Rahman al-Mashhur and his son, Habib `Ali, Habib `Ali al-Habashi, Habib Ahmad bin Hasan al-`Attas, and Shaykh Abu Bakr bin Ahmad al-Khatib. His time in Mishtah was spent teaching the people of the town and mediating between them in disputes. In the last part of the night he would go the Jami` Mosque. He would help the people of the town to wake up before Fajr by giving the adhan and reciting the last verses of Surat Al `Imran. He would do this at the top of his voice since it was before the time of loud speakers. He would then pray the Witr prayer and recite the Qur’an until Fajr. Some of his students would read to him after Fajr. The rest of his day would be spent in teaching and worship. Like many of his predecessors, he would read part of Imam al-Ghazali’s Ihya’ `Ulum al-Din every day and as soon as he finished the book he would start from the beginning again. At times he would begin the reading of Sahih al-Bukhari at the grave of his ancestor, Shaykh Abu Bakr bin Salim and would also complete the reading there. He lived in the days when printed books where still rare and was an expert at hand copying books. He wrote numerous copies of the Qur’an as well as other books with his own hand. He is known for his immense humility. If he attended a gathering of knowledge over which someone else was presiding he would sit at the edge of the gathering and not say a word, in spite of his great knowledge. When a number of students came to Mishtah to learn from him, he asked why they were coming to him. He heard a voice informing him that it was due to the great mercy that he showed to people. He saw himself as being indebted to his students rather than his students being indebted to him. In 1363, he set aside land to be used as a graveyard for the people of the town, which he named ‘al-Rawdah’. Prior to this, the people of Mishtah would bury their dead in Tarim or `Aynat, but Habib Salim relieved them of the hardship of doing so. He built a mosque there, dug a well and planted numerous date palms. He died after a short illness on 29th Rajab 1378 (1959). He had already designated the place in which he wished to be buried next to the mosque he built in al-Rawdah. His son, Habib Muhammad, later extended the building to include an area where children could study the Qur’an. In 1429 (2008), Hadramawt was struck by severe flooding. Mishtah was one of the towns that suffered most damage. Many houses were destroyed, driving their inhabitants to move to Tarim. The musalla in al-Rawdah was destroyed and many of the graves around it were damaged. Habib Salim’s grave, however, remained intact and the musalla has now been beautifully rebuilt on firmer foundations, designed to resist future flooding. A ribat has now been opened there which is a branch of Dar al-Mustafa. Habib Salim’s progeny went on to render great services to Islam: his son Habib Muhammad gave his life for the religion and Habib Muhammad’s two sons, Habib `Ali al-Mashhur and Habib `Umar, are currently continuing the work of their father and grandfather. The ijazah is the licence or permission given by the shaykh to the student to transmit knowledge.